Han Solo – Imperial Cadet #1 opens on Corellia when Han and Qi’ra are still scum rats for Lady Proxima. It shows a few jobs they went on as they dreamed of getting away, then it overlaps with the events from the Solo movie. Then it goes into the parts that the film didn’t explore, Han’s Imperial training. It’s kind of an odd way to setup the story since it takes so long to do so, but that’s what they do. When Han does get to the training camp on Carida, they put him in basic training which, interestingly enough, looks like the Mimban scenes in Solo. They get the same armor, and they’re in the rain. Han is portrayed as someone who is pretty naive and completely clueless to taking orders. It doesn’t take long before he tries to escape by stealing a TIE fighter, which he then ends up crashing. While the story has action and keeps a quick pace, it lacks credibility or believably. If someone were to tell you this story is suppose to be canon, your first instinct would be to laugh. When you realize it’s true, it’s kind of sad. I’ve read a lot of comics of the years, a lot of Star Wars comics, and when you look at the writing of this one and compare it to everything that’s come before it, this one doesn’t hold up very well. It’s fairly mediocre. Here’s the thing. Sure there’s the allure to make Han this rebellious smart aleck who bucks authority at every chance. It makes it easy to write the character when you do that. But it also cheapens the credibility of the story. Han might buck authority, but he’s not an idiot. He knows how to go along to get along, otherwise he wouldn’t have survived so long in the Imperial armed forces. If he did the things he did in this comic, they would have just executed him. The key is to give a bit of both. You have to show Han being the good soldier and excelling in some things, while also doing other things that just rub the Empire the wrong way. You have to give them a reason to put up with him before you have him destroy all their stuff and go AWOL. The artwork is okay, but it’s not the greatest. It’s not as cartoony as the cover, which is a good thing. There’s some detail, a good sense of the action and emotion, but the colors are just a little dull overall. There’s just something about the color palette that feels a tad bit muted. Regardless, it does get the job done. Kicking off this new mini-series, I’m not a big fan of this first issue. The story, the writing and the artwork are not blowing me away. It’s not generating any interest. 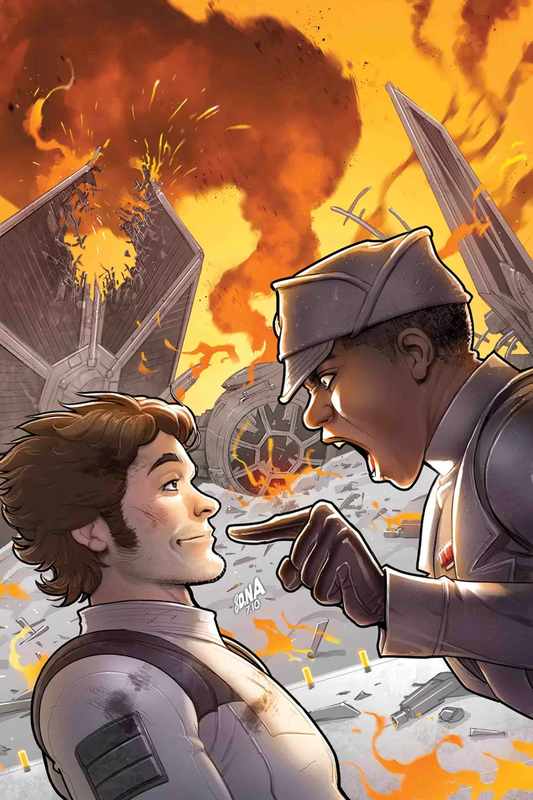 If I wasn’t such a die hard Star Wars fan, I’d probably drop this series if the next issue didn’t turn things around. As is, I give this one a two out of five metal bikinis.